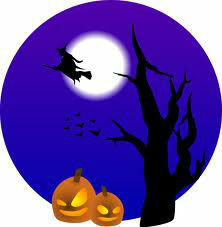 Trick-or-Treating in the Village will be on Wednesday, October 31, 2012. While there are no mandated hours, the Police Department recommends that little ghouls and goblins start activity no earlier than noon and cease when daylight hours end. Remember, curfew prohibits anyone under 17 years of age to be on the street after 11:00 p.m. on weeknights. Kids should trick-or-treat with parents or in groups-never alone. Wear light colored or reflective clothing. Masks should not obstruct vision. Carry a flashlight after dark. Stay on sidewalks and never walk in the street. Cross streets carefully and always at corners-no jaywalking. Limit trick-or-treating to your immediate neighborhood. Trick-or-treat only at homes where outside lights are on. Parents, check your child's treats before eating. Vandalism is a crime. Halloween is not an excuse to damage or destroy someone else's property. As a reminder to parents that may be accompanying their children while they are trick-or-treating; Per local ordinance, "...no person is permitted to drink any intoxicating liquors upon any street, or in any outdoor place open to the public in the Village."